Beautiful, competitively priced and practical treehouses. Our structures create spaces that feel good to be in, are great to look at, and create wonderful memories for you and your guests. People are always looking for new experiences, and opportunities to live outside their normal lives. They want times to remember, times to share, times spent with friends and family. That is where New Leaf 042 comes in, an elegant solution to spending time in nature. And with our range of extras you can always offer something new and exciting. I was lucky enough to have had the opportunity to stay in a New Leaf Treehouse. I loved it, everything about it, and I hope to find these treehouses in other beautiful locations next time I go away. At New Leaf Treehouse Company we’re proud to design, build and install amazing treehouses inspired by nature and our woodlands. 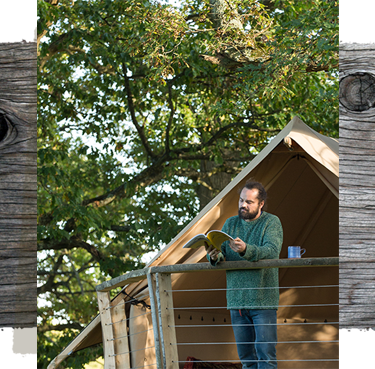 Working with a range of glamping companies and private clients, we create structures that feel good to be in, are great to look at, and make perfect business sense. Across the UK and beyond they are ideal for team building, corporate events, glamping and stag and hen parties. Our ergonomic and stylish designs are respectful to our natural world and the environment, from conception to construction. For all designs we use locally sourced and sustainable wood, such as Sweet Chestnut and Douglas Fir, as well as choosing local suppliers. Once completed, our treehouses will always connect their occupants with their surroundings and offer a beautiful, renewed perspective on life and the unique luxury that nature presents. In our modern world where we are always ‘switched on’ and ‘connected’, they can be the ideal break from the noise. “For me it's all about getting back to nature where you can take the time to breath, soak up natures beauty, and take in the energy of our great and varied woodlands. What’s better than a steaming pot of fresh coffee relaxing in your treehouse on a beautiful spring morning? 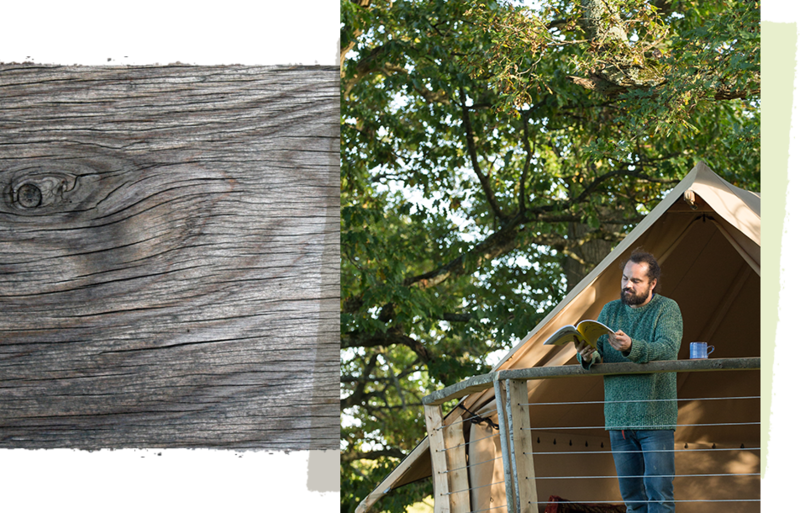 Stick around and browse our treehouse designs and read our story to understand more about our passion and what we can do for you. If you would like to make an enquiry, please call 01403 288470, email info@newleafthc.co.uk, or complete our contact form. We will get in touch as soon as possible to help you achieve the perfect wooded escape. New Leaf Treehouses have an experienced team that have worked together on a large number of different treehouse projects. Over the years we have honed our process so that all projects are delivered on time and on budget, always exceeding the customers expectations. This a detailed evaluation including possible orientation, heights, suitability of existing trees and ground condition. We take various photos and also use online resources such as Google Earth to assess the potential of the site. New Leaf Treehouse Company can assist you with all aspects of the planning process. The process typically takes 8 weeks. Ne Leaf will provide expert and experienced consultancy for each project ensuring you get the right treehouse for you. Each treehouse can be personally detailed with lots of extra features available from wood burning stoves to hot tubs.